NELSON’S FAMOUS SIGNAL AT TRAFALGAR on October 21, 1805. Nelson sent his signal at the beginning of the battle in which he received his fatal wound. 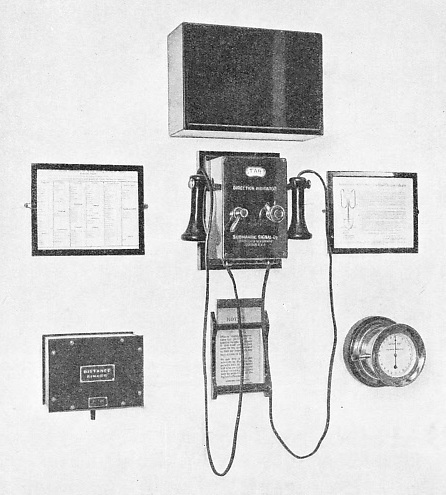 This photograph shows the signal on the wall of the Nelson Room at Lloyd’s. 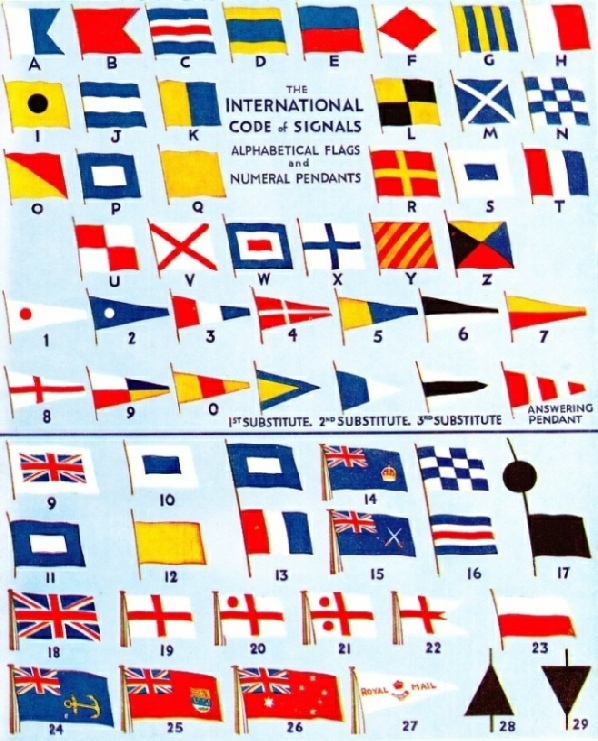 To-day ships carry complete sets of forty signalling flags. Ships of the Navy have, in addition, numerous naval code flags. “WHEN you wish to assemble the captains of your ships or to to speak with them, you will put on the mainmast a square banner tied in a weft.” Such is the instruction of the Gunner of the King of France in the first sea signalling manual, published in 1543. Captains are further directed to place banners in different parts of their ships, to shout, blow trumpets and beat drums, and to “ hang out a flaming cresset ” at night, to communicate with one another. From these crude beginnings signalling at sea has become a fine art, culminating in the revision of the International Signal Code in 1934, the flags of which are given in the accompanying coloured plate. 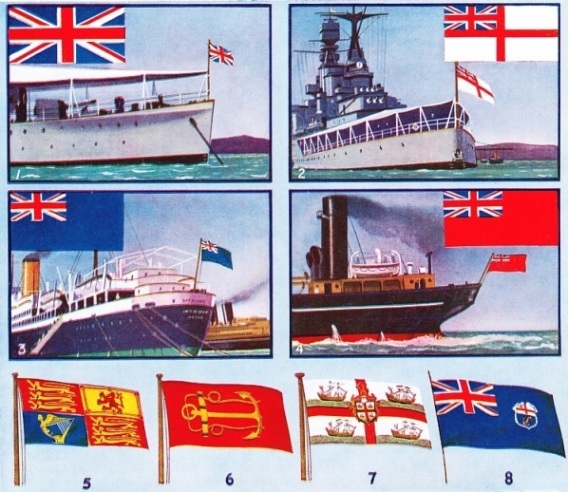 Almost every ship carries a complete set, which consists of twenty-six alphabetical, ten numeral, three substitute flags and the answering pendant. Bars, stripes, crosses and other marks are so arranged that, should - the colours be indistinguishable, the flags are immediately recognizable by their markings in all conditions of daylight. Besides being used as a decimal point when signalling figures, the answering flag has a variety of uses. The substitute flags are used to avoid the repetition of a letter in a signal. For instance, “A A A” in the code (meaning “1 point on the port bow”) would necessitate three “A” flags being carried; but, using substitutes, the first repeats the first flag in the group hoisted, the second repeats the second flag, and so on. Thus, “D H D L”, which is the code signal allotted to the Hamburg South American liner Cap Arcona, is signalled by using the flags “D H - first substitute - L”; while “A J J O”, which stands for Liverpool, is signalled “A J - second substitute - O”. G-I require a pilot; H-I have a pilot on board; I-I am altering course to port; J-I am going to send a message by semaphore; K-You should stop your vessel instantly; L-You should stop. I have something important to communicate; M-I have a doctor on board; N-No (negative); O-Man overboard! ; P-(Blue Peter—in harbour. (At sea—your lights are out); Q-My vessel is healthy. I request free pratique; R-The way is off my ship; S-Engines are going astern; T-Do not pass ahead of me; U-You are standing into danger; V-I require assistance; W-I require medical assistance; X-Stop carrying out your intention and watch my signals; Y-I am carrying mails; Z-Used to address or call shore signal stations. 11. The Blue Peter - vessel about to sail. 23. British Pilot Boat Flag. 24. Blue Ensign, flown by Fleet Auxiliaries. 28. Cone warning of Northerly Gale. 29. Cone warning of Southerly Gale. Where a signal contains three similar letters, it is given in this way: “S W S S”, standing for the Greek ship Zannis L. Cambanis, would be hoisted as “S W - first substitute - third substitute”. To acknowledge a signal the answering pendant is hoisted “close up” - as far as it will go - then lowered to the “dip”, and the next hoist is made by the ship transmitting the message, so as to be ready for hoisting “close up” in acknowledgment of the next part of the message. Should a ship be unable to read a signal she keeps her answering flag at the “dip” and herself hoists a signal such as “U W” - “I cannot distinguish your flags”. The answering pendant is hoisted at the conclusion of a message. The code is divided into single-letter signals, two-letter, three-letter and four-letter groups, the code book being arranged so as to facilitate easy reference either to groups of flags or to their meaning. A - Undergoing speed trial. B - Taking in or unloading explosives. D - Keep clear of me. E - I am altering my course to starboard. F - I am disabled. Communicate with me. G - Want a pilot. H - I have a pilot on board. I - I am altering my course to port. J - I am about to send a message by semaphore. K - Stop your vessel instantly. L - Stop. I have something important to communicate. M - I have a doctor on board. P - (in harbour) - All persons to repair on board as the vessel is about to proceed to sea. (Hoisted at the foremast head, the “Blue Peter”). P - (at sea) - Your lights are out, or burning badly. Q - My vessel is healthy. Request free pratique. R - Way is off my ship - feel your way past me. S - I am going full speed astern. T - Do not pass ahead of me. U - You are standing into danger. V - I require assistance. W - I require medical assistance. X - Stop carrying out your intentions and watch for my signals. Y - I am carrying mails. Z - Calling shore station. “ P” followed by four numerals indicates latitude and longitude, so that “P 1025-P 5036” means “Latitude 10° 25’ - longitude 50° 36”. “T” followed by figures represents time, reckoned on the twenty-four hours system, thus, “T 0230” means “2.30 a.m.”, “ T 1430” means “2.30 p.m.”. “X” followed by numerals is used to signal bearings. “X 90” means “Bearing 90 true”, and can be used with other signals. SUBMARINE SIGNAL DIRECTION INDICATOR. 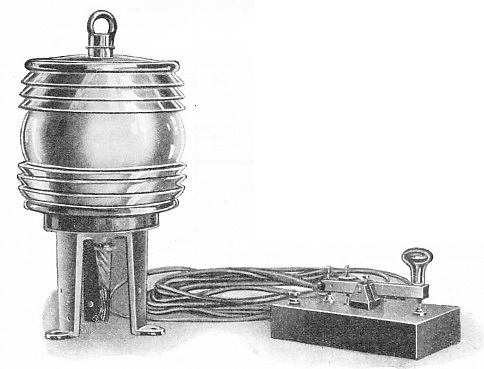 This comprises submarine signal receiving and distance-finding equipment. By receiving wireless signals and the submarine bell from a transmitting station, a ship’s distance can be accurately measured. This is done by comparing the difference in time taken to receive the two signals. B L - “Aeroplane is down in position indicated and requires immediate assistance”. B Y - “I am forced to alight. Stand by to pick up crew”. G F - “Buoy is awash and difficult to locate”. G K - “Buoy you are approaching is not in its proper position”. O L - “Heave to or I will open fire on you”. Y Q - “Barometer is falling”. Y R - “Barometer is rising”. Three-letter groups indicate points of the compass, bearings, times, and tenses of verbs, and so on. A A A S - Aberdeen. A C D U - Brighton. A F C Z - Dungeness. A G J V - Glasgow. A G O V - Gravesend. A J M F - London - King George Dock. A M P M - Plymouth, etc. Four-letter groups are allotted also to ships, the nationality of which is indicated by the first letter of the group, for distinguishing purposes. THE MORSE CODE is in general use throughout the world. This is a simple code, based on a combination of dots and dashes. The most frequently used letters are the shortest in Morse - thus, E is one dot, T is one dash. The code is transmitted by numerous methods, including the “buzzer”, flag, searchlight and lamp. G - Great Britain, also M.
K - United States of America, also N and W.
L A - L N - Norway. P A - P I - Holland. Thus, Aquitania is “G L R Z”, Homeric “G D L J”, Bremen “D O A H”, and Atlantis “G L T M”. 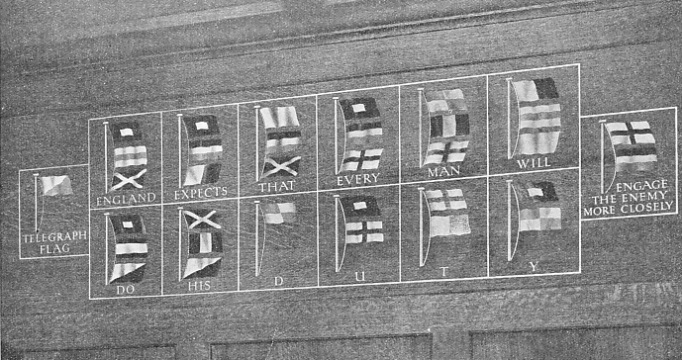 Ships’ signal letters and wireless call-signs differed at one time, but now vessels use their wireless call letters when flag-signalling or otherwise transmitting their names. Those not equipped with wireless are given the call-sign they would have if they were so fitted. 1. Union Flag, flown at the bow by all warships when at anchor. 2. White Ensign, flown by H.M. warships and yachts of the Royal Yacht Squadron (R.Y.S.). 3. Blue Ensign - R.N.R. ensign, flown by merchant ships commanded by R.N. retired and R.N.R. officers, in certain conditions, and by approved members of certain yacht clubs. 4. Red Ensign, flown by all other merchant ships. 8. Lloyd’s Ensign, flown at signal stations. Should a ship wish to transmit a message which cannot be conveyed by the existing code, but must be spelt out, as with a name and address, the answering pendant is hoisted over the letter “E”, meaning that the letters shown after it are to be taken as spelling a word, and not as code signals. Answering pendant over “F” indicates the end of a word, or a dot between initial letters; and the answering pendant over “G” means that the spelling is concluded, and that the subsequent flags represent code signals. Message: “ Please inform owner - William Thomson, Liverpool, expect to arrive Tuesday”. Answering pendant and E - Alphabetical letters follow. Answering pendant and F - End of word. Answering pendant and G - End of spelling. P K - second substitute - “Tuesday”. The answering pendant is then hoisted to indicate that the message is finished. One-letter signals are used also to communicate between vessels towing and being towed. 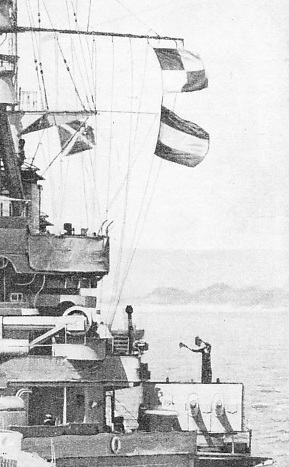 “A”, shown by a ship towing, means “Is the towing hawser fast?” and the same flag, by the ship towed, “Towing hawser is fast”. There are several pilot signals. The code flags “G” or “P T” indicate a “I require a pilot”, as does the Pilot Jack (the Union Jack with a white border) when hoisted at the fore. By night a blue light shown every quarter of an hour, a white light frequently flashed just above the bulwarks, or “P T” in the Morse code is used for the same purpose. In the Channel, where pilot cutters of several nationalities await incoming ships, blasts on the whistle or flashes with a lamp show the port for which a pilot is required. Five blasts or flashes, or a red over two white lights, means Antwerp; a long-short on the whistle or white light over red, London; four blasts or flashes, or two vertical white lights, Rotterdam; three blasts, or a red light over white, Amsterdam; and six blasts or flashes, Dunkirk. Ships entering port show the “Q” flag, meaning “My ship is healthy”. “Q Q” (“Q” and first substitute), “I am suspect - I have had cases of infectious diseases”, indicates that medical attention is required before pratique will be given, and “Q L” means “My ship is infected”, when strict measures will be taken to ensure that no disease is transmitted to the shore. SIGNALLING IN H.M.S. REPULSE. Note the insulated leads of the wireless, the flag signals at the yards, the signalling searchlight for long-distance Morse messages, the mechanical semaphore on the lower bridge, and the bluejacket signalling with hand flags. H.M.S. Repulse, completed in 1916, has a tonnage of 26,500 and a speed of 32 knots. Since January 1, 1933, British ships of over 150 tons register, engaged on oversea voyages, have been compelled to carry a signalling lamp. It is placed at the masthead or in some other conspicuous position, and the Morse code is used to transmit messages. A hand-flag also is used in connexion with Morse, a small wave of the flag indicating a dot, and a large sweep of the flag a dash. The one-flag signal code is used with lamp flashes or whistle blasts in Morse, for conveying urgent messages. The mechanical semaphore and semaphore flags are both in extensive use at sea to-day. The accompanying illustration shows this system, which every officer of the Merchant Service must know. Messages so sent are generally spelt out, and thus a code book is unnecessary. In foggy districts submarine bell signalling is used and many lightships are fitted for the purpose. The sound travels through the water and is picked up by vessels equipped with a suitable receiver. Each lightship has its own “call”, sometimes its wireless call-sign, which is given out on the submarine bell or oscillator. By receiving wireless signals and the submarine bell from a transmitting station, a ship’s distance can be accurately measured. This is done by comparing the difference in time taken to receive the two signals. Wireless waves travel faster than the submarine sounds, and the interval between the two indicates the distance away of the transmitter. Calculations are made also with wireless and ordinary sound fog-horns. Another, but rarer, method of signalling is by groups of “shapes’’ - balls, cones and squares. Storm signals are exhibited on the coast to warn seamen of approaching gales. A cone, hoisted point uppermost, or a triangle of lights, point uppermost, generally indicates a gale from the north, and the same signals reversed a gale from the south. This system is almost universal, but where easterly gales are to be expected the cone, when hoisted point uppermost, may mean a gale from that quarter. There are other local exceptions. The United States have a different system. A red flag with a black centre is hoisted as a storm signal, with pendants to indicate the direction from which it is expected. A red pendant indicates from north-east to south, a white one from north to south-west. When a hurricane is expected, as frequently happens off the coast of Florida, two red flags with black centres are hoisted. At night, a red light is shown for easterly winds, and white and red light, for westerly. A “gale” generally means that wind is expected blowing at Force Eight in the Beaufort Scale - that is, a velocity of about forty miles an hour. All too frequently distress signals follow those indicating a storm. The code flags “N C” mean “I am in distress and in need of immediate assistance”. A square flag, with a ball, or anything resembling a ball, hoisted with it, has the same meaning. Continuous blowing of the siren or fog-horn, the firing of a gun at minute intervals, flames from a burning tar barrel, flaming paraffin-soaked rags and the firing of rockets are all recognized distress signals. There are, in addition, the ordinary Board of Trade signals of the flare type. THE KEY AND THE LAMP are an integral part of Morse signalling equipment. On the right is the key, on which messages are tapped out by hand. The depression of the key completes the electric circuit. The lamp is attached to a prominent part of the ship. Since January 1, 1933, British ships of over 150 tons register, engaged on overseas voyages, have been compelled to carry a signalling lamp, which is generally fixed at the masthead. Certain signals also are exhibited by lightships and lighthouses to call the attention of coastguards and lifeboat crews to vessels observed in distress. These generally consist of guns fired at regular intervals and of rockets. A rocket throwing a white star indicates that the life-saving (breeches buoy) apparatus has been called out; a rocket with green stars, that the lifeboat is being manned. By day, a rectangular flag shows that the former is on its way, and a triangular red flag the latter. A flag or white light held steady - “You may land here”. Flag or flare waved from side to side - “Keep off, dangerous to land”. Flag or flare waved and pointed to left or right - “Land in the direction indicated”. Two flags or flares held about fifty yards apart - “Land on this line of approach”. All over the world ports have their own code of sign als made by balls, flags, semaphore arms and lights to control the entry and departure of vessels. The depth of water to be expected in the entrance to the harbour, or the conditions prevailing on a bar are shown for the information of ships approaching from seaward. A black ball or green light - “Less than ten feet of water in the entrance”. A red flag or red light - “More than ten feet of water”. A red light on the swing bridge inside the harbour - “Navigation is obstructed”. A green light - “Bridge is closed”. A white light - “Bridge is open”. Navies have flag-signalling codes of their own, which are used for transmitting orders and carrying out evolutions. Wireless has not replaced this old-fashioned method of controlling a fleet, since wireless can be “jammed” by an enemy; but flags cannot be interfered with and have a good chance of being seen by the ships concerned. 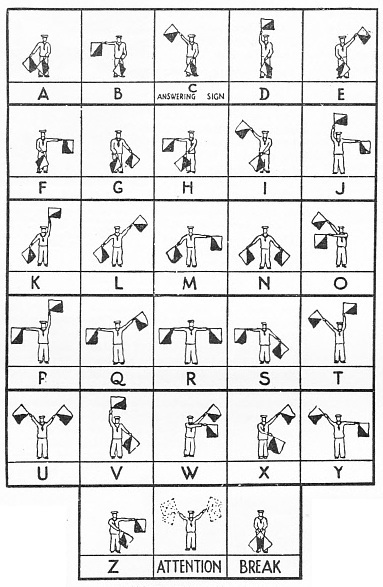 SEMAPHORE SIGNALLING with hand flags - generally blue and white - is a common method of sending messages when the receiver is not far away. Certain letters are basically linked: thus, in A, B, C and D, the flag held in the left hand is kept in one position; in P, Q, R and S, the right-hand flag is kept in one position; and so forth. You can read more on “Buoys and Beacons”, “Day and Night Signals at Sea”, “Distant Signalling at Sea” and “House Flags and Funnels” on this website.